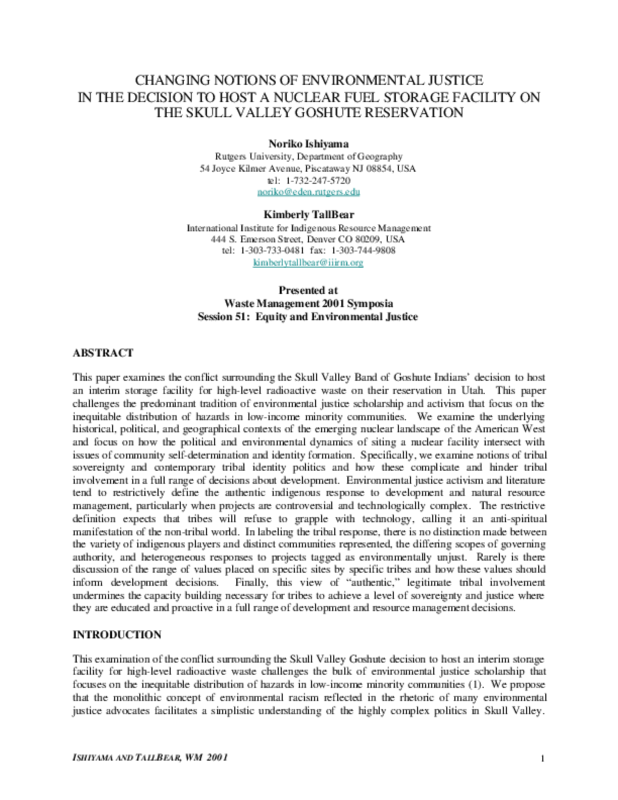 This paper examines the conflict surrounding the Skull Valley Band of Goshute Indians' decision to host an interim storage facility for high-level radioactive waste on their reservation in Utah. This paper challenges the predominant tradition of environmental justice scholarship and activism that focus on the inequitable distribution of hazards in low-income minority communities. We examine the underlying historical, political, and geographical contexts of the emerging nuclear landscape of the American West and focus on how the political and environmental dynamics of siting a nuclear facility intersect with issues of community self-determination and identity formation. Specifically, we examine notions of tribal sovereignty and contemporary tribal identity politics and how these complicate and hinder tribal involvement in a full range of decisions about development. Environmental justice activism and literature tend to restrictively define the authentic indigenous response to development and natural resource management, particularly when projects are controversial and technologically complex. The restrictive definition expects that tribes will refuse to grapple with technology, calling it an anti-spiritual manifestation of the non-tribal world. In labeling the tribal response, there is no distinction made between the variety of indigenous players and distinct communities represented, the differing scopes of governing authority, and heterogeneous responses to projects tagged as environmentally unjust. Rarely is there discussion of the range of values placed on specific sites by specific tribes and how these values should inform development decisions. Finally, this view of "authentic," legitimate tribal involvement undermines the capacity building necessary for tribes to achieve a level of sovereignty and justice where they are educated and proactive in a full range of development and resource management decisions. Copyright 2001 International Institute for Indigenous Resource Management. All rights reserved.